Recently, AmericanMuscle traveled to the Carlisle, PA for the annual Ford Nationals show. While at the show, the AM team had the opportunity to help out one of the biggest Mustang enthusiast’s you’ll ever meet– a 3 year old Make-A-Wish child named Caleb. Caleb is one of the biggest Mustang fans you’ll ever meet– at just a glance he can tell you whether he’s looking at an EcoBoost or GT model. Unfortunately, due to various health issues Caleb has had a bumpy road so far in his life. For his Make-A-Wish, Caleb wanted to go to Mustang Week, which he will be attending in a few weeks. Going to an event like Mustang Week, there is no other way to show up than in your own sick Mustang, which is where AmericanMuscle comes in. At our Carlisle booth, we had the Bama Performance Powered ’15 GT and ’15 EcoBoost, Chris Allen’s Turbo GT drift car, MMD V-Series, and MMD by Foose on display with a special VIP spot saved on the end. In the spot, was a spot-on Boss 302 Power Wheels sporting the hot Competition Orange paint and a few custom add-on’s from AM waiting for Caleb. 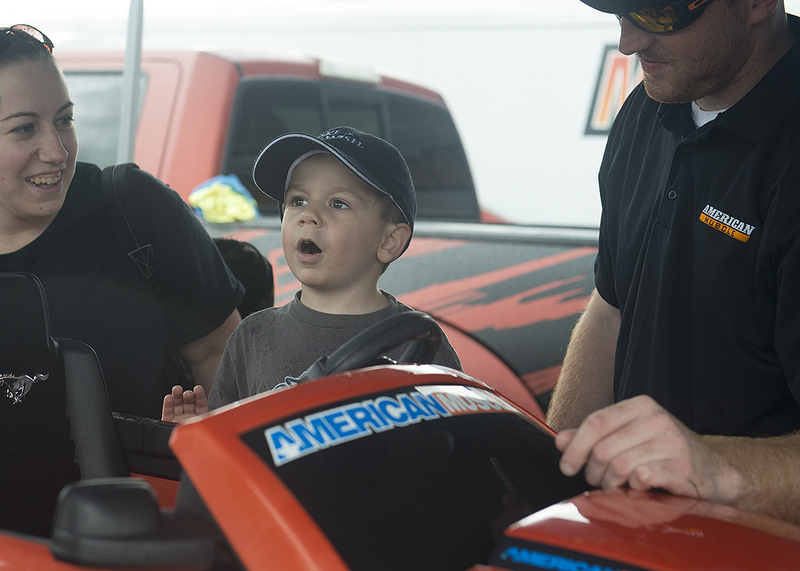 On Saturday, Caleb and his parents stopped by to checkout all of the activities and sights at the AmericanMuscle booth. Making their way down the row of fleet cars, eventually Caleb spotted the miniature-Mustang with his name on it and immediately became overwhelmed with excitement. As soon as he got in the driver’s seat, he stepped on the pedal and spun the rear tires, throwing a huge smile on his face. Throughout the rest of the day at the show, Caleb drove his new Boss all over the show, doing burnouts whenever and wherever he could. The AM team could not have been happier to spend some time with Caleb and to get him rolling in a Mustang of his own.